Searching for the right wedding gift can be a stressful experience. You desperately want to give the couple something beautiful and meaningful, but you may lack in ideas as well as in confidence about how to choose the most appropriate present. You could always buy something off the gift registry that the couple arranged, however, if these two people are particularly special to you, do you really want them to be reminded of you each time they use your toaster? You could of course purchase an exquisite set of china they picked out, but at the end of the day, an unexpected gift is often warmly received because it shows that you took the time to come up with something special. Stand out from the crowd. Use your innate common sense, good manners and social etiquette to pick out a thoughtful, useful and memorable gift for the bride and groom. An Eternity Rose is such a gift. Each time they look at this high-quality and elegant piece of art, they will remember you with affection. For you, giving an Eternity Rose has two primary advantages. First, you can shop conveniently online from your own private space, at home or in the office. This saves you from parking hassles and from having to visit store after store to find the right gift. Second, you are giving an exquisite gem of a gift that will end up displayed in a cabinet or positioned near the wedding picture for all to see. It truly is the most appropriate gift for the new couple, embodying their eternal love. Planning a wedding can consume all of your energy, with having to organize the ceremony venue, reception, flowers, food, cake, dresses, suits, invitations etc…, the list goes on and on. Who should receive a gift? The bride and groom giving a gift to each other is an age-old tradition. Though it isn’t required, most couples feel the desire to mark this special occasion with a private gift exchange. It is fitting to mark the beginning of your life together with a symbol of your commitment and love. 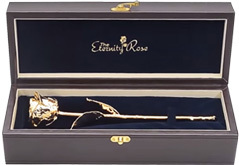 Such a gift is an Eternity Rose, which will last a lifetime, available in a range of beautiful colors with gold-trimming, or coated in a precious metal such as 24 karat gold, platinum or silver. 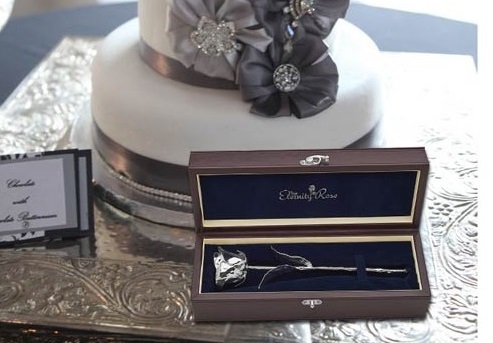 You can engrave the rose with the wedding date and each of your names. 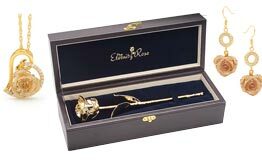 Many customers get the stem of their Eternity Rose engraved with words from the wedding vows, plus the date of the wedding. And if you give your ‘spouse to be’ an Eternity Rose on your wedding day, you could start a beautiful new tradition of giving them an Eternity Rose on each anniversary year ahead. The Eternity Roses come in a range of beautiful colors, and if you read our section on Anniversary Gifts by Year, you can learn about the specific color that each anniversary year is associated with. For example, the first anniversary is associated with the colors gold and yellow, and so a lovely Gold-Dipped Eternity Rose, or a Yellow Glazed Eternity Rose could be most fitting. Acknowledging your parents on this big day is appropriate. They have raised you and travelled along with you to this new chapter of your life. 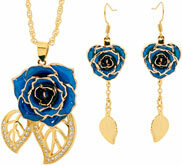 An Eternity Rose is a fitting symbol of the love and gratitude you feel toward them. Each time they look at it in years to come, as it sits in pride of place in a special display location, they will think of your wedding day and your love. The female members of the wedding party work hard, both before the wedding and during it. They help you plan the big day, throw showers for you, help you relax by listening to you when the preparation gets too much, and help you pick the perfect dress. Show your gratitude with an Eternity Rose, which is an elegant way to express your thanks to them for being part of this big day. Every time they look at it, they will remember the fun and the frustration of getting you to the church on time. The groom’s helpers also work hard, but in a different way. They put on the bachelor party and make sure you choose the right tuxedo. They may help make arrangements for the honeymoon, and make sure friends and family are properly seated at the ceremony. Whatever their tasks, you couldn’t do it without them. Several may have had to travel far to get to your wedding to show their support and friendship. They had to rent a suit to fit in properly with the wedding party. Acknowledge their effort and expense, and most importantly, their emotional support to you. The Eternity Rose website offers gifts that are unique, high-quality and real conversation starters. 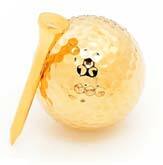 Consider giving them a gold-plated golf ball and tee set, or a set of gold-plated poker cards. They will remember your wedding each time they use or look at these gifts, and your bonds with them will forever remain. You want to express your appreciation to important family members, guests and members of the wedding party by giving them a gift. They have taken the time to be there for you at every step of the way, and supported you in the planning and execution of this big day. Giving them a special gift with a personal note is warmly appreciated. 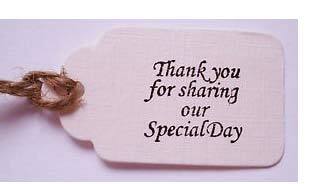 You help them feel included and important on your big day. 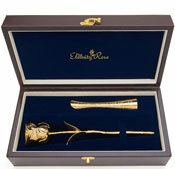 Engraving the gift also adds a special and personal touch. It shows your thoughtfulness, your gratitude and your acknowledgement of their place in your life. You don’t need to over spend your budget when giving these gifts to guests and members of the wedding. The important thing is that the gift is personal, appropriate and given with love.